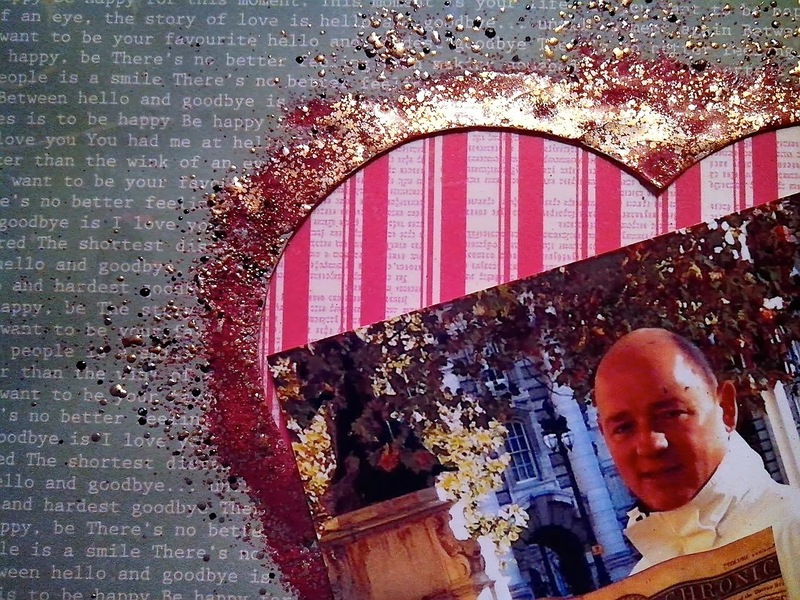 With Valentines Day just a couple of weeks away I thought I'd share this romantic layout I put together using papers from the new Telegraph Road collection, a February release from Kaisercraft and a Jones Crafts DT project for Jan. Lovely papers, gorgeous colours. the bling is Stampendous aged scarlet Embossing enamel from their Frantage Holiday Kit. To be in it to win it all you have to do is leave a comment here on this post before 12 midnight on 27th February. The winner will be announced here on the blog on 28th. To visit Jones Crafts Facebook page click here, and if you're a retailer click here to visit their web site. I'm joining John, Darren, Sandra and the Jones Team on their stand at Stitches, the Craft Hobby and Stitch International show for retailers and craft buyers at the NEC later this month, and will be hosting the Graphic 45 make and take sessions on the stand. Papers and staples have been generously donated by Diane Shultz and Charee at Graphic 45. Thank you both. If you're coming along to the show, call by the stand L26 say hi, and if you'd like to join a make and take session e mail John direct at johnashley@jonesnottm.co.uk and book your place. The countdown has started………. there are only 21 sleeps left until our Graphic 45 Weekend Retreat. Its nearly another sell out with only two places left. If you fancy coming along, having a really crafty weekend making a fabulous Couture Keepsake album from cover to cover and meeting up with lots of other crafters, the Crafty elf and myself click here for more info. We'd love you to join us. oOooo so lovely! thanks for a chance of winning. That layout is stunning the way you created the halo effect around the heart. Would love to know how you did that. I love your layout! Thanks for the chance of winning as well! I love your choice of giveaway, is beeautiful. Thank you for the chance to win it!!! I already have some great plans for a tag mini with the Botanical Tea collection if I win. What a perfect prize to create something fresh for spring. As always beautiful work. Love that telephone! I love the Victorian feel to the layout. And the Botanical Tea papers look so sweet and girly girl! I would love to win this and make an album for my mom, who just called yesterday and told me and my sister her cancer is in remission. She doesn't scrapbook but she loves everything we make her. I have used many of your techinques in my albums and they are easy to follow, thanks Claire. This is oh so cute! Thank you for sharing everything. This paper is too beautiful. p.s. The link you have put for your blog in your YT video announcing the Give-away doesn't work. How wonderful! I love Graphic 45, & always get praise for my works done with them. Clare is such an inspiration, & I look forward to the day I am able to do a Clare Charvill workshop! Lovely papers in that stack. Hi from the US! I absolutely love these papers and love your albums!! Thank you for all you do and share with us! Wow that paper is so beautiful! Hi Clare, I'm new to your blog but subscribe to you on you tube. I love Graphic 45 and their Botanucal Tea paper pad is beautiful. I love the telegraph road layout. That is such beautiful paper thank you for sharing. I would have horded it. Love g45 and have the hardest time making myself use any of it. I enjoy watching all the wonderful art you do but I have to say that purse is simply amazing! Never have I seen anything like it, and if I could find a way, I would borrow it on a forever basis. Thank you for sharing your time and talent. Sandy B. First of all, you have all my respect for everything you've done and for being an inpiration to me. 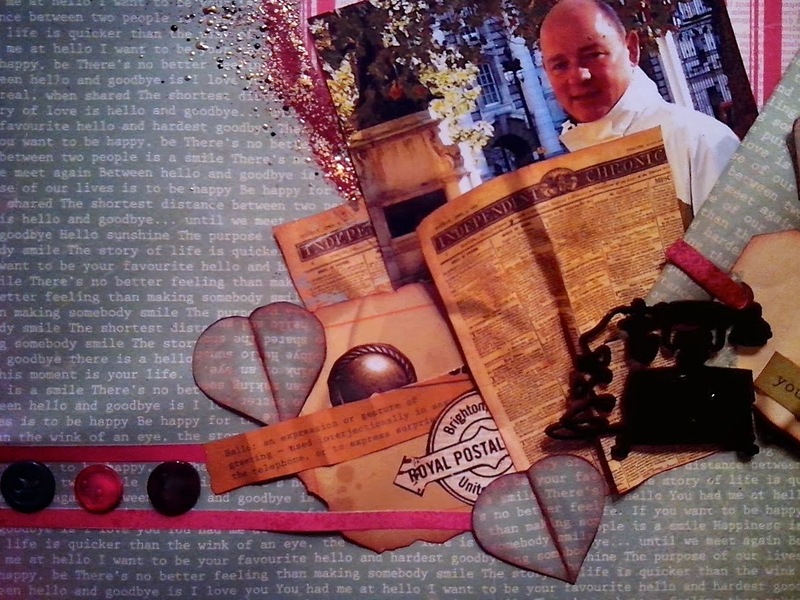 I recently discovered this beautiful world of crafting and scrapbooking and by watching your videos I learned a lot of new things who have fascinated me. Thank you so muh and I wish you good look with everything! I love all the Graphic45 collections but this new one Botanical Tea is absolutely gorgeous! I am inspired by your work. All the best! I love all the G45 items and always love watching whatever you make. Thanks and have a great Feb 1st. Thanks so much for the opportunity and the graphic45 papers are always stunning. Thanks so much for sharing your wonderful talent. Afternoon Clare, Love, love, love, this layout, the papers are absolutely gorgeous, the piccie is fab and the frantage is stunning, love it !! Loving the Botanical Tea papers, gorgeous pastel colourways together with earhy colours, gorgeous. I am going to the NEC, all being well, as I can't seem to get rid of a head cold that I've had for 3 weeks now, doesn't want to leave me, and haven't been able to hear properly, so hopefully will see you for a Make and Take, my fingers are crossed. Take care and enjoy your weekend. I had an un-normal (my words haha) lie-in this morning, our usual alarm clock, Lizzie the cat, didn't do her miaowing from 3am and every hour onwards this morning, so we didn't get up until after 8am, my day is whizzing by which is the downside haha. It was quite funny, one day this week, Lizzie had been miaowing into Graham's ear for a while, he kept ignoring her, then she decided to 'tap' him on his shoulder, genius isn't she haha, much to G's disgust. Once again you have "wowed" us with your talent!! I wonder if Graphic 45 would adopt me?? I love all their papers, this is really pretty. I have really been playing with my papers, embellishments, etc. this past week and feel a teeny tiny bit guilty but this too shall pass, ha, ha!!! Back to playing with papers is much more fun!! Thanks once again for all you do. Clare, Wow!!! What a great giveaway. I love how you embellished with the buttons and layered the papers. I love the Graphic 45 Botanical Tea paper. I collect tea cups that have a floral design on them and I would love to make a mini album to showcase them. Thank you for being my inspiration. Keep up the GREAT work. wow awesome giveaway best of luck to everyone!!! Clare, I would love to win that gorgeous prize pack! Even more exciting will be when we see what you have created with Botanical Tea. Love it! I am relatively knew to your blog but love everything I see so far. I'll be visiting you every time you post! Thanks for all of your creative shares ... appreciate it. I would LOVE to be the chosen one. If not, somebody else will be extremely happy. Good luck everyone ....it is beautiful! Beautiful layout with lots of your trade mark fussy cutting I see. Thanks for the giveaway. Good luck everyone! Love the layout and I love your Youtube videos! Thanks for the chance to win. Just GORGEOUS! Thanks for a chance to win some great candy too. I am so grateful to have found your blog. I have made a couple of your items from your tutorials. You are simply the best instructor yet. Thank you for inspiring me to greater creativity. Love the Graphic 45 give away this month. Good luck to all. Love the botanical vintage images of this paper as well as the colors! This layout is inspiring me! The papers are so cute... Keep it up! Thanks for the Incredible giveaway!! Beautiful paper collection. Thanks you for sharing. I hope to win! Hi! Ms. Clare, love all your projects & tutorials. 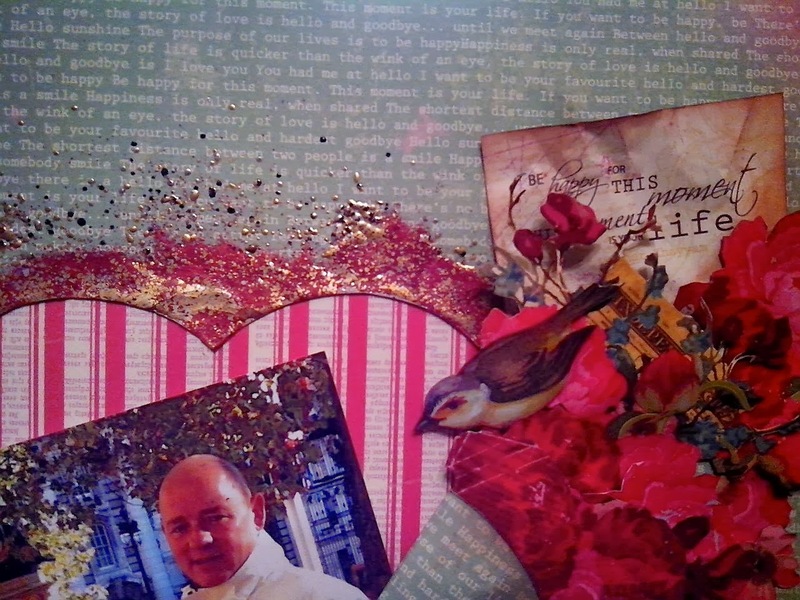 This a beautiful paper fr G45.....all my faves...pink, roses n birds& the vintage feel to it. Thanks for sharing your talent with us. More power to you. Beautiful layout. Love the 3D effect and the papers are fabulous. Have a fabulous day. Love the layout...beautiful! The new Graphic 45 papers are gorgeous. Thanks for the chance to win. I love your books, cards and layouts. I am always inspired by you. I so love this paper....Your layout is gorgeous! Thanks for a chance to win! Love the layout. Would love to win such beautiful paper! Thanks for giveaway. I love the Botanical Tea Paper. I have never worked with Graphic 45 and would love the opportunity. Thanks for the chance to win and for your wonderful inspiration. My mind is spinning with ideas and the possibilities of things to make with that beautiful paper. Thanks for hosting the giveaway!!! I have been following you on YT for some time now and enjoy seeing all your creations. You are so talented! 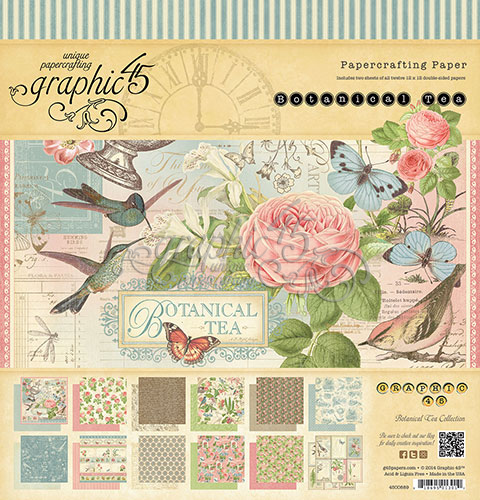 This new paper, Botanical Tea by Graphic 45, is so beautiful! What a wonderful prize it makes. Just love the new papers from Graphic 45. Thanks for the opportunity to win some. This is such a beautiful paper, I have just GOT to have it, please can I be the winner this time. Looking forward to the retreat. Am working on Mother Goose album and having a blast. Love it! I love this paper collection. It´s stunning. Thank you for the chance to winning it. Your layout is so beautiful. I love all your works. Such wonderful fun! thanks for a winning chance. all you do is lovely. Thank you. so lovely. how on earth did you do the heart? excited about the giveaway. the paper looks beautiful. Thanks you soo much for this opportunity Clare, but mostly for sharing the amazing projects you create!. And what an amazing idea for Valentines day! The paper is absolutely beautiful! Love your tutorials. So easy to follow! Thanks for sharing them. Love your creative ideas. I also want to say thanks for all the great tutorials. I have watched them many times and incorporate many of your ideas into my projects. Beautiful layout! Great giveaway. Thank you for the chance to win. I'd love to win this - this collection was my favourite of theirs from CHA! This is my first visit to your blog but i am a subscriber to your YouTube channel. I adore your albums, they are gorgeous and i'm just plucking up the courage to start one of my own; not sure how it will turn out but we shall see. What a great giveaway! Love it beautiful paper.Thanks for the opportunity to win some. First time I have a seen your monthly giveaway and visited your blog. This lovely botanical paper stack has something for everyone--flowers, birds, butterflies. I admire your work so much. Keep inspiring your followers all around the world. That Botanical Tea pad of papers is just beautiful (drooling as I type!) Please please please pick me, pick me! I know just what I want to do with them. I look forward to seeing what you do with them too Claire! What a lovely giveaway! I'd love to win. Thanks. I love your work and workshops. Thanks for being so generous with what you share. Hi, I'm a rather new subscriber to your YouTube channel and just visited your blog for the first time today! I wanted to thank you for offering this giveaway! I'd like to enter for my sister, she LOVES this collection and if I won I'd give it to her! Your layout is gorgeous, love the frantage, your work is amazing. Love this paper collection it got all my colours in it and with look lovely in my stash to stroke for the first few weeks then after that use it. When are you on C&C again have you last shows taped and watch many time. Keep bringing your lovely work to us. Wow that is a wonderfull prize!! That paper is just beautifull!! I would love to have that in my collection!! I love your work, you make wonderfull creations. I'm learning a lot from your style (I like to make mixed media canvas pantings with that girly thouch) thank you for your great work and video's!! Claire, I love, love, love your projects. Your style is much in line with mine. Love those papers! And I'm ready to make another album! Thanks so much for the offer! I see beautiful possibilities coming my way !!! Love the paper and your videos. And I must say, love your name! From Claire -- zanysisters and/or myzanyself! Great layout featuring the "Crafty Elf"!!! I love all of the different techniques that you've used! WOW! Everything I love - birds, butterflies, floral, vintage beauty. This collection is beautiful. How great is this! Went around the pictures of this collection probably 20 times,can't take my mind off of it. What a lovely layout! The botanical Tea papers are luscious and I'd love to win some please! Thanks for the opportunity. Just love this paper line.....they have done it again !!!! yum yum yum. Love this paper line! Absolutely beautifu,! Thanks for giving us a chance fo it. Oh, I adore this paper collection! Would be so happy to win. Beautiful paper, thanks for the chance to participate. such beautiful paper. loved the layout. Thanks for the chance to win this package. I could do so many projects for Spring with this collection. Beautiful layout. Thanks for the chance to win!! Oh what beautiful paper!!!! Graphic 45 has done it again with yet another beautiful design! I love the new tags as well! I can't wait to get started with a new spring project! This paper is perfect for that!!! I really hope I win this one!!! Your work of art is truly amazing!!! I can't wait to see what you will have to share next!!! Thanks for the inspiration!!! Great layout! Love the embossing around the heart. Beautiful layout! Love all the details and the old paper pages. Thank you for another great giveaway! I always look forward to your new videos! TFS! Ooh, the Botanical Tea paper is so beautiful! It would be great to win! I just wanted to say thank you so much for all of your inspiration and generosity both with your work and the giveaway. I would love to win this paper collection...it is absolutely beautiful, Clare. You have been such a inspiration to me and I can't wait to see what you will do with this collection. Love your tutorials! Would love to win, looks gorgeous. WHOOOO HOOO I LOVE THIS PAPER AND YOUR GORGEOUS PROJECTS. Always enjoy your tutorial videos, Clare. Thank you for the chance to win. Thanks for the chance to win such a gorgeous paper pack! Lovely paper! I would love to win. I'm curious to see what you make with the paper, love your tutorials! Great paper for a mother's day project! What a gorgeous layout, love the embossing. And love the giveaway too! Hello from the US! Thanks so much for the chance to win this awesome giveaway! I look forward to seeing what you do with the collection! Gorgeous giveaway set. Would love to win. Hi Claire, not long found you on Youtube and you've been such an inspiration. Would love to come to your classes and wish I lived closer. You'll just have to keep making those amazing video's. Gorgeous candy. Thank you for the chance to win. Love the layout & that embossing enamel is gorgeous! Fabulous giveaway, keeping my fingers firmly crossed for a win! Every digit is crossed in hopes of winning this stunning paper collection! It is absolutely perfect for my "afternoon tea" layouts from my trip to England. Thanks for the opportunity! Hi, Clare~ I love, love, love this collection and am hoping you will feature it in an upcoming mini album video. Thanks ever so much for sharing your beauty and your fabulous talent with us! What a great giveaway! I know what I would do with this to, make a tag album of my Mom of memories of her and the fun times we had. Thanks for the chance to win. I love your videos, such a great inspiration to get on the ball and make beautiful things like you. 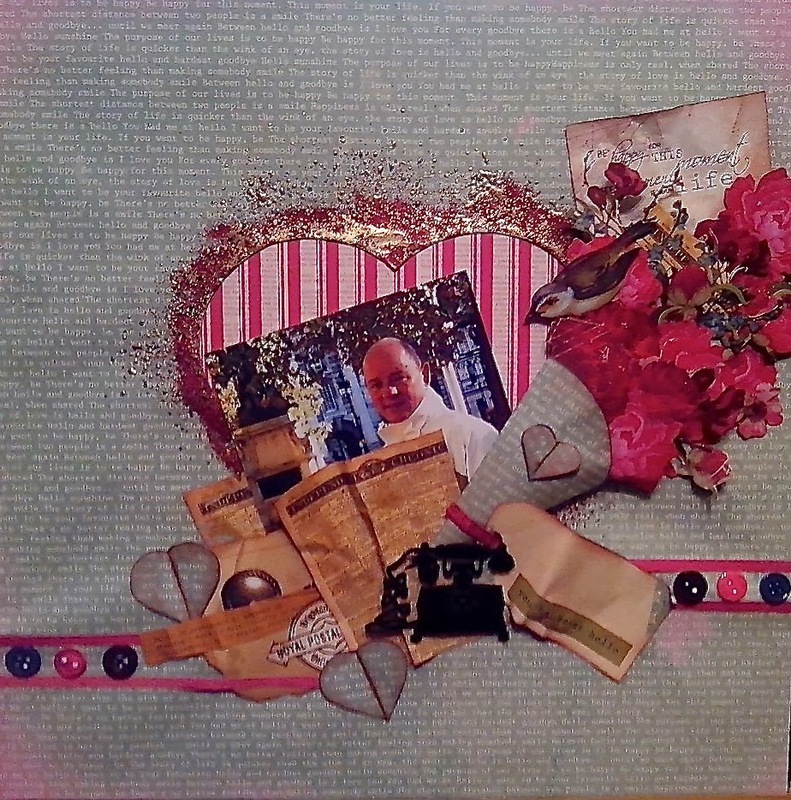 Your scrapbook page you shared today is beautiful. Love the colors and the layout. Heavens above, you have many many entries this month. I love your work and chance to win goodies. Thank you. How cool! Love the paper! Fabulous giveaway.. Just love G45 papers and the lovely projects you make with them. So inspiring. I love G 45 papers and this new collection is must to have.....Thanks for sharing your ideas...you are a wonderful teacher I watch all your videos. Clare, I so love your work and would like to try a mini. This paper is gorgeous. Love these papers and what a great giveaway! A chance to win such beautiful Graphic 45 products brings me joy :) I love this paper collection! Lovely layout and what beautiful papers! I'd love to live a little bit nearer so i could partecipate to your courses and crops, but unluckyly italy is a little bit too much far for me... Good luck! Thank you for the chance to win. Top notch Clare as always. Love your creation! Well, I love ALL of your creations!! Thanks for the give a ways you are doing. Love all the new G45 releases! Greetings Clare. Lovely projects. Thanks for all the great ideas. Looks like another winner from G45! Again absolutely beautiful papers ! Love your work, Clare. Thanks for the chance to win. Love the G45 papers and thanks for the chance to win. Love this new line from G45! Would love to win. This is such beautiful paper. Thanks for the chance to win.